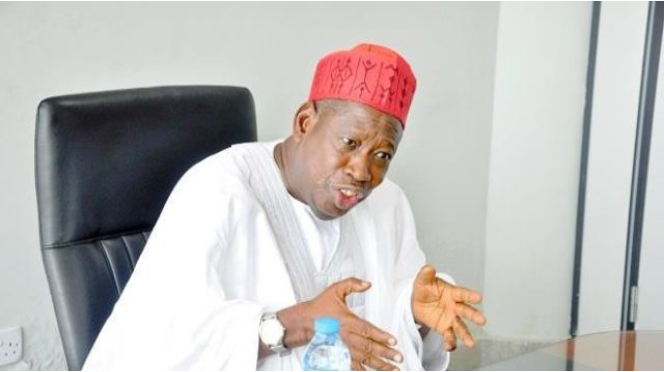 Kano State Governor, Abdulahi Umar Ganduje, has expressed profound gratitude to Allah and the people of Kano State for entrusting him with the mandate to lead the state for another four years. Briefing newsmen on his victory at the poll, Ganduje said with every sense of humility, he accepted the mandate of the people of the state. “This victory is not for me alone. It belongs to you all, regardless of your political inclinations. I may have won your votes, but, it is you the people of the state who have won the election. “With one voice, you’ve chosen continuity over an uncertain future. You came out peacefully to cast your votes, not even the threats of mayhem by our opponents kept you away from voting. “This day, I pledge that I shall devote my self towards bringing greater prosperity, growth and development to the inch of the state, and I shall build on what we’ve been doing since my election in 2015. “The people of Kano State are very happy with the outcome of the election. You can go round the city and the local government areas and hear the sounds of celebration everywhere. Everywhere you go, it is all sounds of victory” he said. The statement, explained that he had overwhelming evidences of violations to press his case. The statement, which described the supplementary election as the most horrific elections ever in the history of the state, alleged that the ruling All Progressives Congress and Kano State government deployed all mechanisms to orchestrate violence against the citizens. “The good people of Kano State and particularly, our teeming supporters, should be patient and remain calm. Kano State is our only home. We have no other place better than this noble state, and no blood of any citizen is worth shedding,” the statement cautioned the party’s supporters.